As the war neared its end, more than 56 million coconut definitives remained in mint condition in London, Kuala Lumpur, and Melbourne (Cockburn 1989). They were perfect for pan-Malaya use, since they carried the king's portrait instead of a specific state sultan. 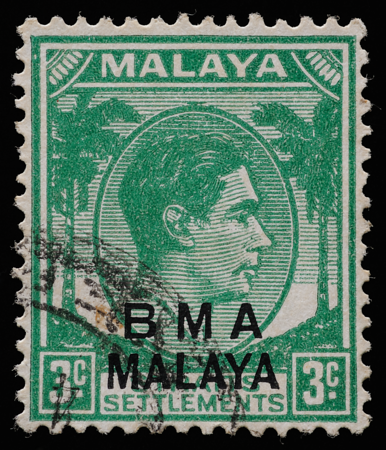 Several months before the Japanese surrender, the Crown Agents tasked De La Rue with an SAS mission: to secretly overprint the stamps with the letters bma malaya, and prepare them for beach landings (Cockburn 1998). De La Rue manufactured three plates of which two were reportedly sent to Kuala Lumpur and Melbourne (Walton 1972, Morris 2017), but their exact circumstances have been disputed (see Barker 1993). The SS Lycaon, SS Antilochus and Jaarstroom eventually helped bring coconut definitives back to Malaya's shores (Peter Cockburn comm. 2017). The typesetter has apparently taken care to both kern and letterspace the glyphs appropriately with respect to one another and to their surroundings, placing the pairs la, ay and ya closer together and spacing out bma. The overprint holds yet another typographic surprise: its two lines are in slightly different typefaces. 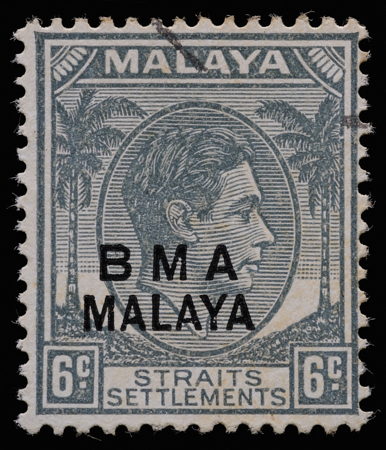 The malaya has narrower letters for economy of space; more unexpectedly, stroke width is constant in bma but variable in malaya. The author suspects that this latter difference, obviously not meant to be perceived by the normal user, may have been an aid for weeding out less meticulous forgeries. 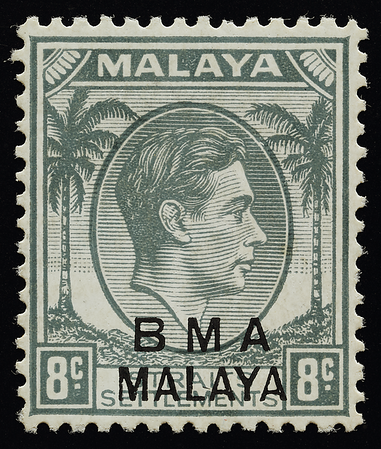 Notwithstanding, the author wonders if the overprint could not have been more succinct in the form of a simple bma in larger and heavier lettering, avoiding the repetition of malaya on the stamp. 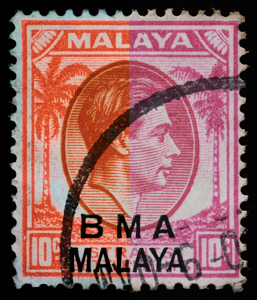 The letterpress effect on the surface of substitute paper of a BMA $5 stamp, with the vertical axis exaggerated four times. 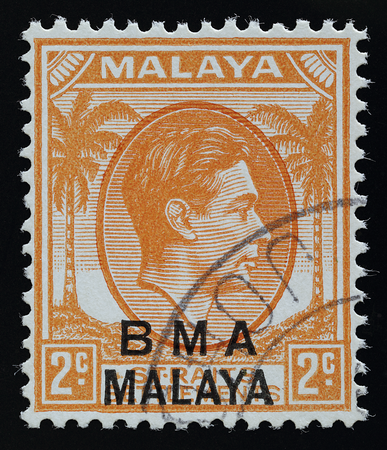 The black patch is the lower part of the vertical stroke of the letter L of the overprint, while the orange ink is part of the second E of the word SETTLEMENTS on the stamp. The overprint has embossed the paper—not surprising given that all the force of the letterpress plate is concentrated on the thin-stroked letters and small overall area of the overprint. This is the anomaly by which albino overprints are detected. 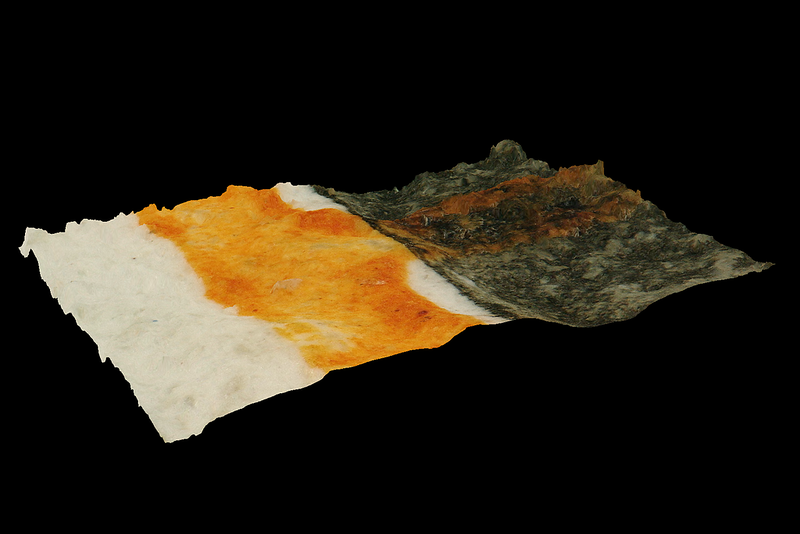 This 3D surface was reconstructed in true colour using a Keyence industrial microscope with reflected annular illumination and extended depth of focus. 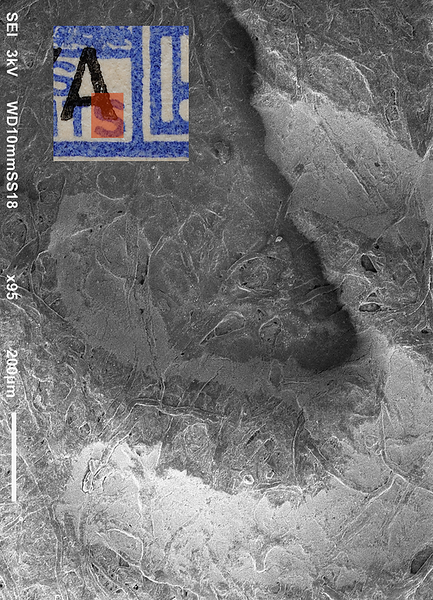 Another visualization of the letterpress effect, in a scanning electron micrograph of the BMA 15¢ on rough paper. The last letter s of settlements appears in a slightly lighter colour than the unprinted parts of the paper and seems slightly depressed. But it is surpassed by the high-pressure BMA overprint, which looks like the footstep of Godzilla. 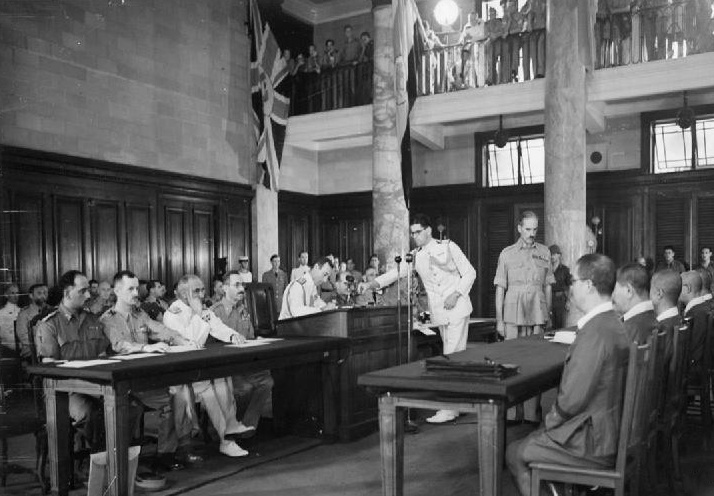 The Japanese surrender on 12 September 1945 at the Municipal Building, Singapore. Signing the document is the Supreme Allied Commander, South East Asia Command, Admiral of the Fleet Lord Louis Mountbatten, who subsequently assumed direct command of the British Military Administration. Source: Imperial War Museum. The British were late, arriving in Malaya almost three weeks after the Japanese surrender. It was only because of false rumours of immediate British return that the nationalistic Kesatuan Rakyat Indonesia Semenanjung in Kuala Lumpur did not declare independence (Cheah 2003), an act that would probably have killed the coconut definitive. 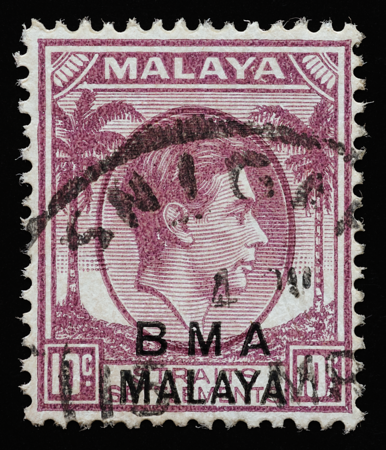 Postmarked in Kota Bahru, Kelantan, the start point of the Japanese invasion of Malaya that ultimately led to the British Military Administration. Malaya was a mess (Donnison 1956). Murder was “extremely common”, far more than the hundreds of reported cases. So dire was the state of affairs that police barricaded themselves in their stations for safety. Piracy was so rampant along the west coast of the peninsula that even ships in harbour were not safe. Public infrastructure was dilapidated, and malnutrition and malaria had spread. The stamp situation was no less chaotic. 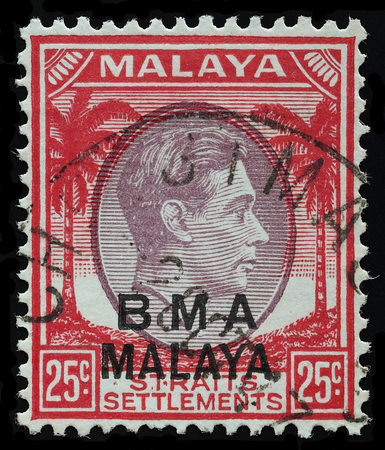 To begin with, the stamps that had been overprinted in London before the surrender were misplaced in transit from Ceylon, forcing Malaya's Chief Civil Affairs Officer Major-General Sir Ralph Hone to order post offices to reopen anyway and accept unstamped mail (letter forwarded to Gibbons Stamp Monthly in January 1967). He said it helped locals keep in touch with their loved ones in difficult times. It did not help that the postage rates had changed. 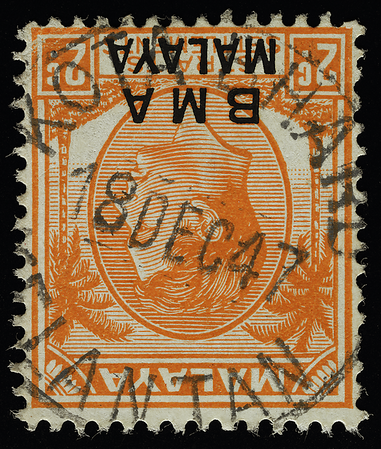 The pre-war 8-cent grey had become obsolete overnight because of Universal Postal Union colour rules. 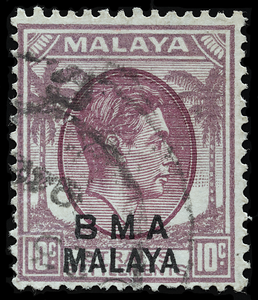 This austere and stately monochrome black-on-grey overprint essay is unique among bma stamps. There exist only 100 to 200 copies, the rest having been destroyed by the post office. A few of the stamps made it onto philatelic covers (Cockburn 1998). Poor Die I (left) and Die II prints suffering from plate wear and/or ink that was too thick or too thin and/or unfavourable physicochemical interaction with the paper coating. The 10 cents has a shifted vignette causing a clash of background lines. 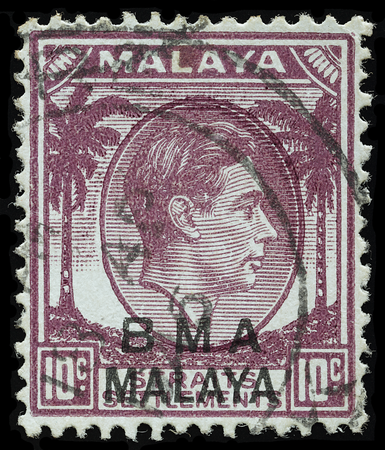 These stamps may be Kuala Lumpur or Melbourne overprintings that evaded London's quality control, exhibiting some of the largest shifts ever observed in BMA overprints, with both horizontal and vertical dislocation. Morris (2017) noted that the Commonwealth Bank of Australia, which overprinted stamps there, "prided themselves on not wasting a single stamp". Overprint creep has most notably been highlighted in the 5c (e.g. Chum 2015), but those are very minor fractional displacements compared to these. Imagine the bottom legs of the 'A' looking like the top of comic character Batman's headgear with two ears sticking up. 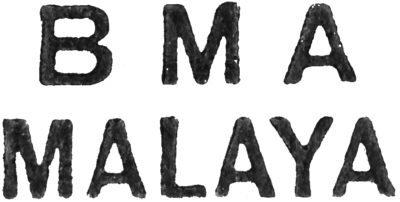 Now imagine the top point of the 'A' looking like the black silhouette of a cat sitting up with its tail hanging down to the right … The right hand leg of 'M' in Malaya looks wobbly and about to fall over to the right. It is a mystery why the Die I print of the 2 cents exists at all and where it originated (Malaya Study Group 1993), since pre-war Die II plates were presumably available. Could logistical complications have somehow necessitated the manufacture of a separate 2c duty plate? Peter Cockburn (comm. 2017) speculates that the single working plate was damaged, necessitating the use of the pre-war 2-cent duty plate. The key plate of the stamp on the left is slightly lighter than its duty plate, while the converse is true for the stamp on the right. The medallion rims are darkened by overlapping lines, creating organic nuances of colour, like the skin and flesh of a juicy orange, that are only possible in a Die I print. The 2 cents Die I in a jumble of Die II's. Some denominations were overprinted with red ink, which proved troublesome at the beginning. Three two-tone varieties of the 10 cents on three different types of paper—substitute, chalky and striated. 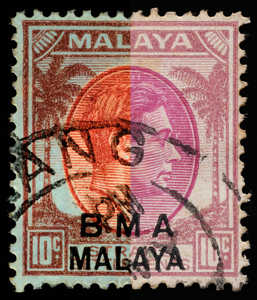 The composite image of each of the first two stamps shows the left half of the stamp under 365 nm longwave ultraviolet irradiation and the right half in daylight. The presence of aniline inks is indicated by "volcanic lava" fluorescence. While only the key plate fluoresces in the first stamp, both key and duty plates fluoresce—to different degrees—in the second. 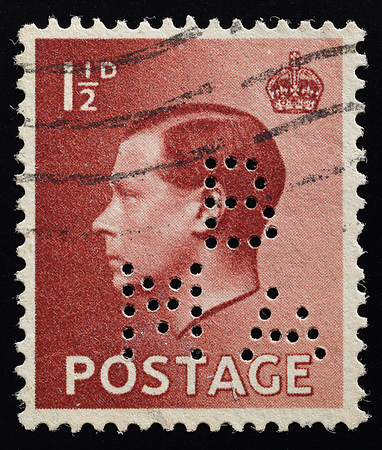 The third stamp does not fluoresce appreciably; it is seen here in daylight. Symmetry in a registered letter from Singapore to Scotland. Chang (2019b) chronicles the postal history of bma. 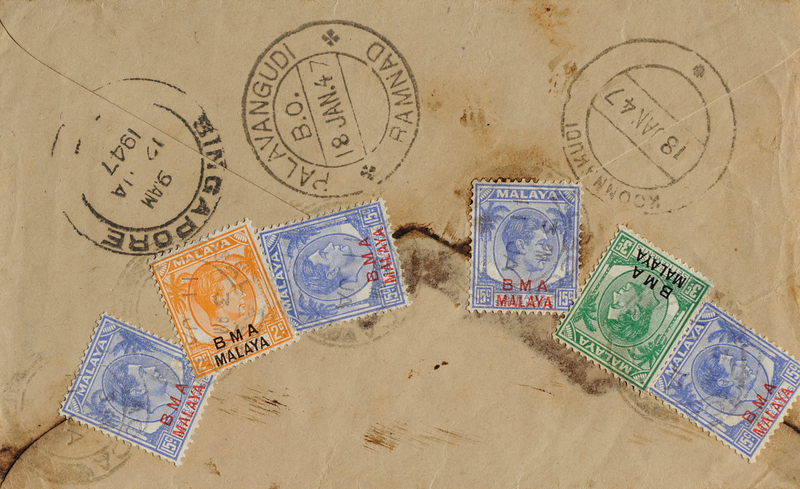 Even postmarks were sometimes messed up, with misspelt SNIGAPORE double-ring cancellations appearing from 14 March to 11 April 1947 (Chua 1987). Interestingly, the author occasionally makes the same error on the keyboard when he types too fast. But back then it was the necessity of focusing one's attention on the carving of individual glyphs that gave birth to this notorious typo. It was perhaps because of wartime neglect and damage that this circular datestamp was missing its month slug, here filled in with pencil. I spotted this in a large old leatherbound accounts book that a retired collector had used as a stamp album. He peeled the stamp off by its hinge and let me have it for $2. Yet it wasn't about the financial transaction; it was the passing of stewardship of history from one generation to the next. 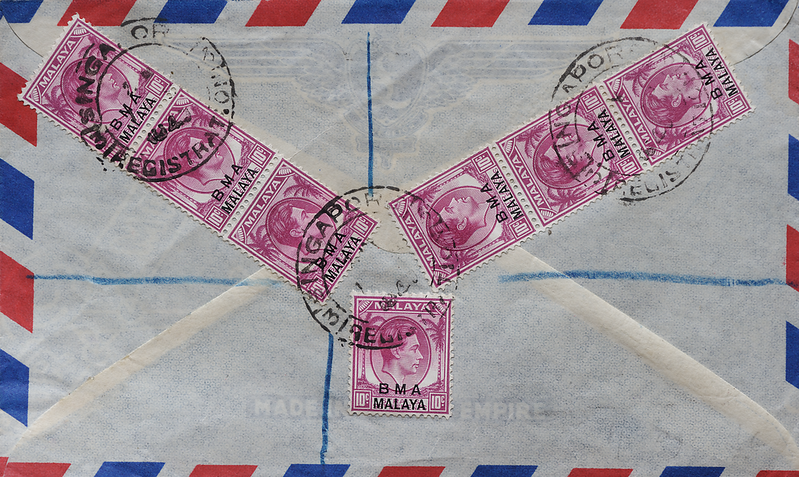 Postmarked on Christmas Island, which was administered from Singapore from 1946 to 1958. 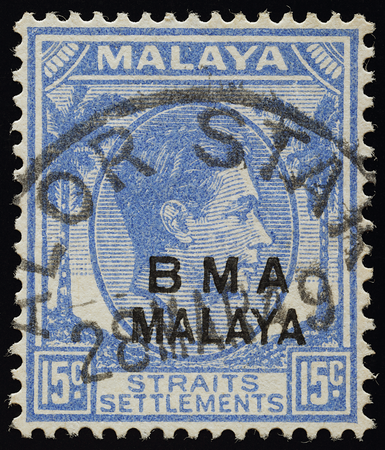 See Singapore for another example of the postmark. Christmas Island is the only location where the geographical range of the coconut definitive overlapped with that of the coconut crab Birgus latro Linnaeus 1767. The largest hermit crab in the world, its legs span more than a metre and its claws pinch with very nearly the force of a lion's jaws. Its flesh has a subtle coconut aroma, originating from one of its favourite foods. Christmas Island also had a part in feeding—and polluting—the world, with its sizeable output of phosphate for making agricultural fertilizer. The military administration lasted less than a year. Even before the civilian government actually took over, philatelic dealers began panic buying over speculation that the stamps may be withdrawn from circulation (The Straits Times, 14 January 1946). 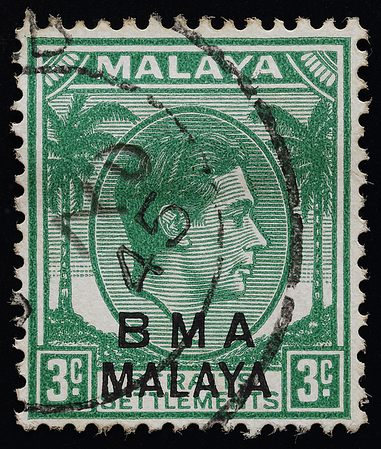 As it turned out, bma stamps were used as late as 1957 (Chang 2010), including revenue use until at least 1954 (Cockburn 2014). 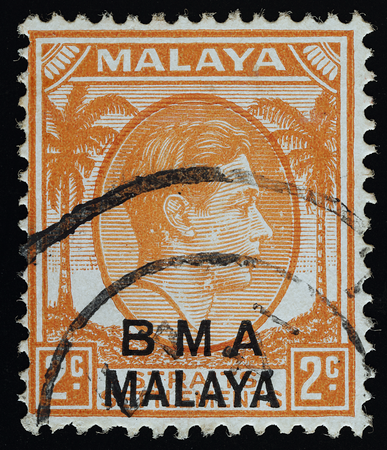 Holley (2019) recounts that when he first saw the bma malaya stamps he found it curious that they seemed to have been overprinted by the British Medical Association. That’s probably it on this stamp.